The new Yamaha FJ-09 is an amazing bike that riders of all types enjoy. Unfortunately a narrow factory windshield leaves more to be desired for wind protection. Parabellum has designed, tested and produced an aesthetically pleasing touring shield that keeps the rider in quiet calm air. 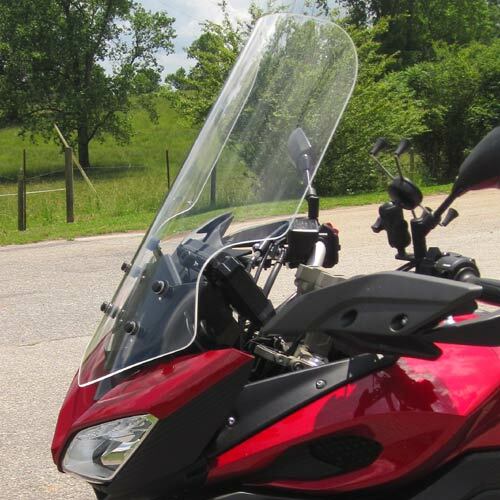 Comfort and ride-ability are taken to the next level with this windscreen. Mounting to the factory Yamaha windshield location, the position of the windshield can be moved up and down. 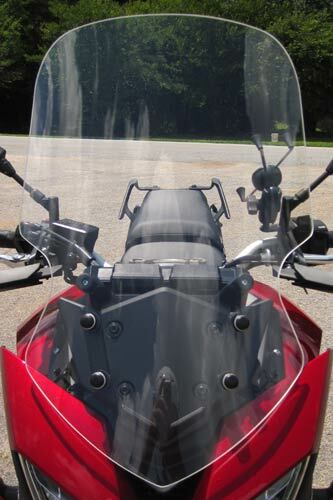 Couple that with the adjustable seat height, and the rider can find a setting that enables the windshield to work perfectly for them. Our screen is made of 3/16 inch military aircraft grade cast acrylic and has a maximum width of 16 inches and is 15 inches wide at the top. (The stock shield has a maximum width of 13 inches with a top width of 11 inches). 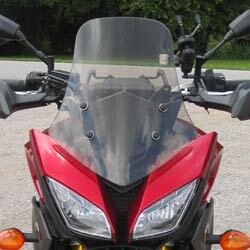 The windscreen is offered in clear or tint and 3 different heights.